Pianist Gloria Chien debuted with the Boston Symphony Orchestra at 16. An avid chamber musician, she has collaborated with many artists and chamber groups. She is director of the chamber music institute at the Music@Menlo festival. A native of Taiwan, Ms. Chien is a graduate of the New England Conservatory. She is an artist-in-residence at Lee University in Cleveland, Tennessee, and a Steinway Artist. This season, violinist Bella Hristova performs concerto, recital, and chamber music concerts in the USA and abroad. Winner of a 2013 Avery Fisher Career Grant, first prizes in the 2009 Young Concert Artists International Auditions and the 2007 Michael Hill International Violin Competition in New Zealand, she was also laureate of the 2006 International Violin Competition of Indianapolis. A former member of CMS Two, Ms. Hristova attended the Curtis Institute, and received her artist diploma at Indiana University. She plays a 1655 Nicolò Amati violin. Violinist Danbi Um won Astral Artists’ 2015 National Auditions, and is a member of CMS Two. At age ten she was admitted to the Curtis Institute, completing a bachelor’s degree. She also holds an Artist Diploma from Indiana University. She plays on a 1683 “ex-Petschek” Nicolo Amati violin. Violist Mark Holloway is a chamber musician much in demand. Past principal violist at Tanglewood and of the New York String Orchestra, and has performed on radio and television throughout the Americas and Europe. He has recorded for the Marlboro Recording Society, CMS Live, Music@Menlo LIVE, Naxos, and Albany labels. A former member of CMS Two, Mr. Holloway studied at the Curtis Institute and received his bachelor’s degree from Boston University. Cellist Dmitri Atapine is an avid chamber musician. His awards include first prizes at the Carlos Prieto Cello Competition, the Premio Vittorio Gui, and at Plowman chamber competitions. His recordings include a critically acclaimed world premiere of Lowell Liebermann’s complete works for cello and piano. Mr. Atapine holds a doctorate from Yale University. The artistic director of Ribadesella Chamber Music Festival and the Argenta Concert Series, he is the cello professor at the University of Nevada, Reno and a member of CMS Two. 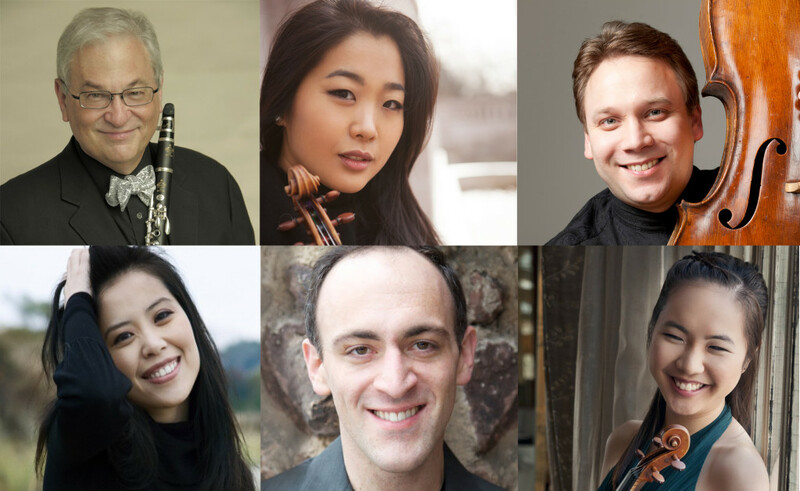 A Yale University faculty member since 1987, clarinetist David Shifrin is artistic director of Yale’s Chamber Music Society series and Yale in New York, a concert series at Carnegie Hall. He has performed with the CMS since 1982 and was artistic director from 1992 to 2004, inaugurating the CMS Two program. He has been artistic director of Chamber Music Northwest in Portland, OR, since 1981. He has held principal clarinet positions in The Cleveland Orchestra and the American Symphony under Leopold Stokowski. His recordings have been nominated for three Grammy awards and his Mozart Clarinet Concerto recording was named Record of the Year by Stereo Review. He has new chamber music recordings being released this year. Contrasts is based on Hungarian and Romanian dance melodies, divided into three movements. Bartók wrote the work in response to a letter from violinist Joseph Szigeti, although it was officially commissioned by clarinetist Benny Goodman. Szigeti originally wanted Bartók to write a short piece with two movements lasting 6–7 minutes. The first version of the work, titled Rhapsody, received its premiere on 9 January 1939 at Carnegie Hall, with Szigeti, Goodman, and pianist Endre Petri performing. Bartók subsequently added a middle movement and changed the work’s title to Contrasts. Szigeti, Goodman and Bartók first performed the final, three-movement work at Carnegie Hall on 21 April 1940. The movements contrast in tempo. The first movement contains a cadenza for clarinet and the last one a cadenza for violin. The piece features examples of alternate or dual-thirds (C and C♯ in an A triad). This structure may be thought of as bitonal, in that the major and minor third of a triad are used. The first movement, Verbunkos is based on a stately and stylized Hungarian Recruiting Dance, measured in rhythm and rich in melodic embellishments. It begins with a lively violin pizzicato, after which the clarinet introduces the main theme, which is then varied. In this section, Bartok’s jazz-like writing is thought to have been influenced by the second movement of Ravel’s violin sonata entitled “Blues”. The second movement, Pihenő, is much more introspective, with a continuously shifting mood and without a defined theme. This movement has been described as volcanic rather than relaxing, despite its title, “relaxation” or “rest”. The third movement, Sebes, is a frenzied dance that begins with a scordatura where the violinist must retune two strings, lowering the E and raising the G a semitone each, after which the clarinet introduces the main theme. In the middle, there is a slower section in the time signature 3+2+3+2+3/8, after which the pattern of variations on the theme is resumed. The trio of this movement features Bulgarian rhythm and is similar in spirit to the Finale of the first Violin Sonata. Shostakovich was the first major Russian composer to receive his entire musical education under the Soviet regime. His fame rests largely on his 15 symphonies and 15 string quartets, but he also composed concertos, film music, opera, and other forms including two piano trios. His Piano Trio No.2 was written during the summer of 1944 as a memorial to his close friend Ivan Sollertinsky, a music critic and brilliant intellectual, who had died in a Nazi concentration camp. Although not formally programmatic, this trio reflects the pain and devastation of World War II, and is similar to many of Shostakovich’s other works in which introspective, melancholic, or even despairing moments are contrasted with flashes of brilliance and playfulness. Each of the four movements is highly original in style and content. The introduction to the Andante features extraordinary tonal colour, produced by setting high harmonics in the cello far above low notes played on the violin. Repeated staccato notes lead to the Moderato, the main body of the movement, in which the principal theme has a folk-like quality. Other folk tunes follow and build to a powerful climax before fading to a quiet close. The second movement is a whirlwind Scherzo, in which the gaiety has a forced, almost drunken, quality. According to Shostakovich’s friend, Dmitri Rabinovich, a leading music critic, the first two movements are connected by the unity of their optimistic colouring and are similar in their emotional content, although they employ different means of expression. The Largo is only 53 bars long. A mournful passacaglia, it is a set of variations on eight grave and ponderous chords on the piano, accompanied by a sober lament from the strings. It leads without pause into the final Allegretto, the themes of which resemble frenzied Yiddish dance tunes. However, these sound more like dances of death than celebrations of life. The music gradually becomes more ethereal, with a poignant reference to the third movement, before the trio reaches a quiet conclusion. Shostakovich completes the journey from life to death in the final notes, commemorating the life of Sollertinsky and of all who died tragically before their time. Mozart wrote this clarinet quintet and the famous clarinet concerto in 1789 for Anton Stadler, his friend and a gifted clarinetist in the court orchestra of Vienna, giving it the subtitle “Stadler’s Quintet”. The general tone of this work is sunny and radiant. The blend and balance of the clarinet with the strings is considered the acme of perfection. After a songful opening theme for the strings, the clarinet enters with an upward arpeggiated motif. The first violin introduces the second theme – a series of gently flowing phrases over a pizzicato accompaniment by the cello, followed by a third glorious theme shared by the violin and clarinet. The development is based on the original clarinet phrase, now given to the strings. All these themes, slightly modified, are reintroduced in the recapitulation. The Larghetto is a flowing song for the clarinet set over muted strings. In the middle section, there is a slightly agitated dialogue between the first violin and clarinet. The fine effect of the chalumeau, or low register of the clarinet, is especially notable in this movement. The Menuetto is more intense, emotional and expressive than the usual dance movement of this form. In the first trio, Mozart moves into A minor, using the strings alone to produce a somewhat anxious and breathless effect, and also includes a canon between the first violin and viola. The second trio, in A major, a rustic peasant dance, is essentially a clarinet piece – an idyll set in the style of a folk song. The Finale consists of a theme and six variations. The theme’s simple melody is reminiscent of the first movement and the variations are recollections of motifs heard in previous movements. Of particular interest are variation III, a mournful lament in the minor key, and the slower variation V with its somber melodic line. Good cheer returns in the final variation, bringing a sprightly close to this beautiful and gentle masterpiece.